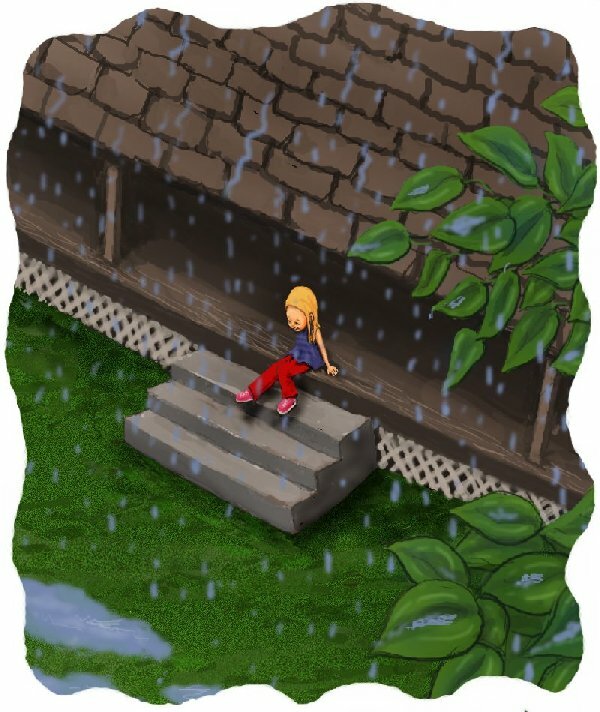 Little Tina sat on the front porch steps and stared at the rain. 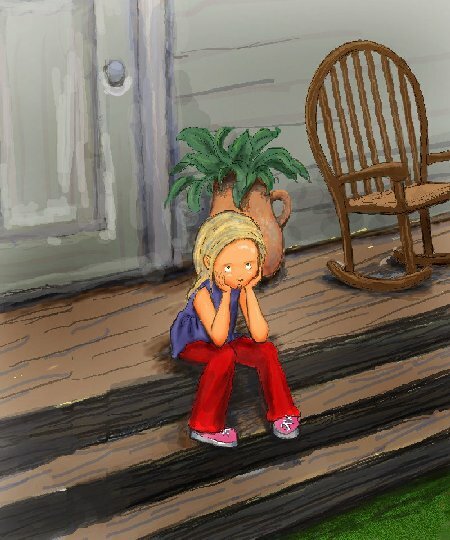 She stared at the gray sky, the gray street, and the gray house across the street. She stuck her tongue out at the world. Boring, she thought. Theyd been in the new house for two days. Boxes still filled every room. After watching the rain form a small gray river on her street, Tina went inside. 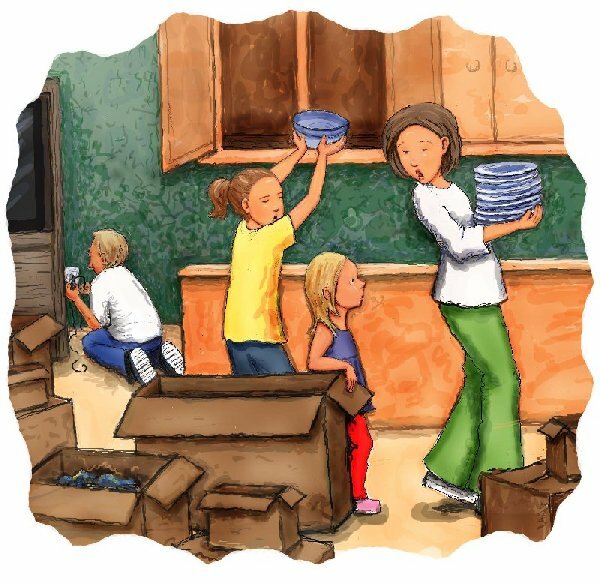 Mommy and Marie were unpacking the kitchen. Dad grumbled from the TV room. Tina didnt even try to talk to him. Instead, she went back out on the porch and sat at the top of the steps. Watching as the raindrops fell, she stuck her tiny pink sneaker out past the safety of the roof. In no time at all, her shoe was wet. Pulling her foot back she reached down and slipped the shoe off. Then she stuck her other foot out into the rain, much farther this time. Soon her shoe, her sock, and the whole leg of her pants were wet. Again, she pulled her foot back and slipped off her shoe and the sock. Tina stood and took one giant step from under the roof. The rain fell on her head and dripped down to her toes. So, off came her shirt. Off came her soggy blue pants. With her hand on the rail, Tina stepped down to the bottom step. She walked down the sidewalk. She stepped on the grass. The river in the street crept into the yard. Tina touched the muddy water with her big toe. Tina laughed. She jumped. The water came to her knees. She splashed. She sloshed. She giggled. Water sparkled in the air and on her skin. 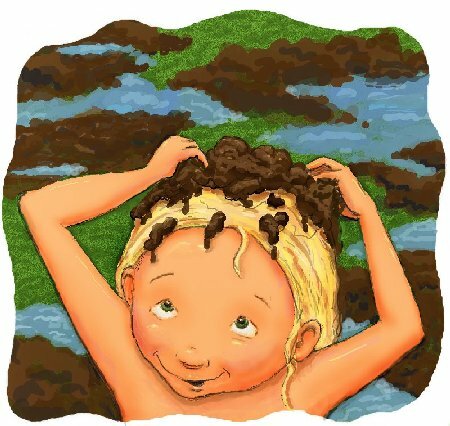 Tina made a crown of mud. She put it in her hair and sat down on the river bank. Silver, she thought as she looked at the clouds, the rain, and the house across the street. Mom looked out the window. Seeing a tiny sneaker on the porch, she walked outside. On the steps lay a pile of clothes, soggy little socks, pants, and a shirt. 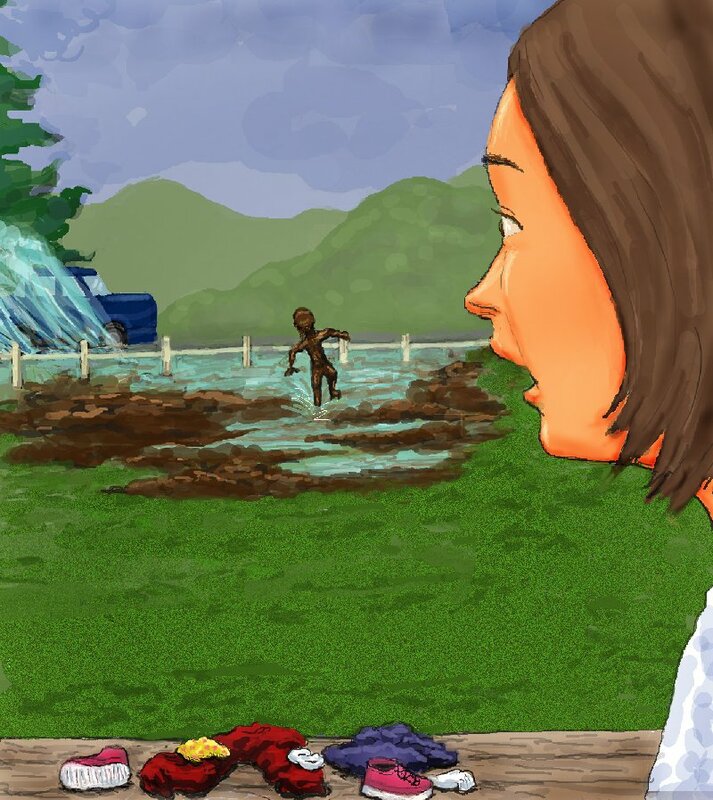 Then she saw a green-eyed mud-monster walking toward the house. A blue car splashed down the river. 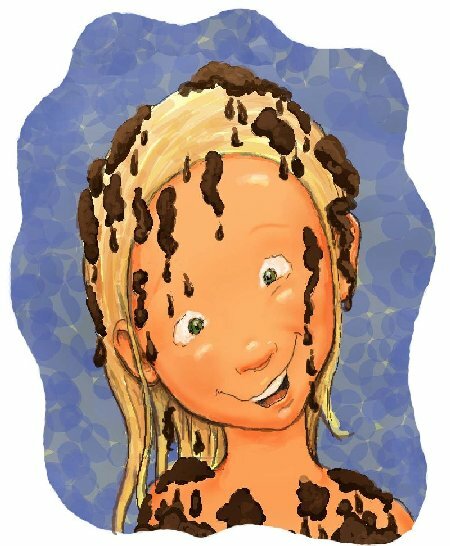 A sheet of water crashed over the mud-monsters head. The sun came out from behind a silver-lined cloud. Tina dripped. She drip, drip, dripped water. She drop, drop, dropped mud. Mom went to find the hose. Tinas eyes flashed, and her teeth sparkled in the sun. About the Illustrrator: Holly Turner lives in the mountains of Western NC with her husband and two children. She has dreamed of illustrating children’s books since she was a young girl, and continues to this day to have a passion for this venue. 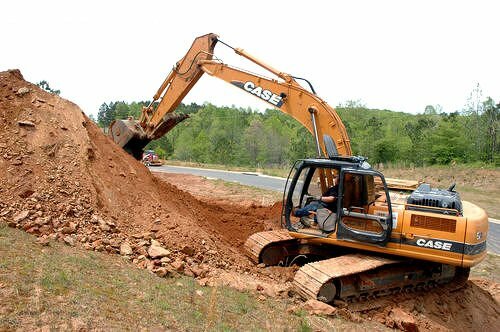 Holly also loves sculpting clay at home and sculpting landscapes with track hoes at work. A new hobby that she finds terribly fun and fascinating is computer animation. You may review more of Holly's illustrations at www.photobucket.com/hollyturner and you may contact Holly at hollyaturner@aol.com.